A weight of 578g (size men’s L) makes the Sprayway Hydrolite II instantly appealing. I also like the location of the pockets as they can be easily accessed while wearing a rucksack. The hood gets a wired peak so it can be moulded to provide a really good visor, even if you’ve just unstuffed the hood from the collar or your pocket, as the hood can both be rolled down or fully removed. The hood also moves well with the head. But all that instant appeal is dampened a little when it comes to this Sprayway Hydrolite II’s other features. The fabric is a 2.5-layer material with Print Technology on the inside to manage condensation. The lab results for the fabric indicate that it isn’t the most breathable option out there, and it feels a bit clammy even when you aren’t being active. The higher-priced 2.5-layer materials control condensation better than this, so at this price I would generally favour a 3-layer fabric or a mesh lining for comfort. But you can’t have everything for £110. Those two main chest pockets are useful but they are mesh-lined, so they’re not going to keep rain out as well as sealed pockets will. The third chest pocket is quite small and only really of use for a mobile phone or perhaps a GPS receiver. 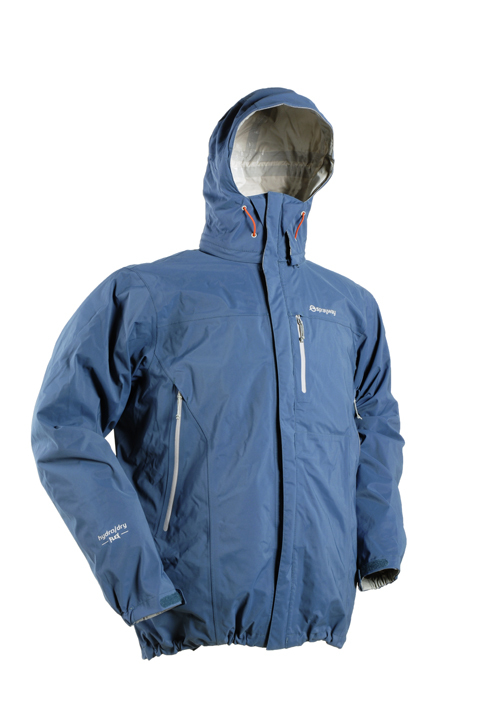 The Sprayway Hydrolite II wouldn’t be my first choice for hillwalking; but it has a good hood and two pockets you can access with a rucksack, which can be hard to find.